Digital Transformation: What’s Behind This Tech Buzzword? Digital technology is so much a part of our daily lives that we hardly think about it. From the smartphones in our pockets, to the Fitbits on our wrists, to the cross-platform apps we use at home and work, we’re surrounded by it. But while keeping up with the latest technology personally might be a way to impress your friends, the stakes are much higher when it comes to business. In fact, it’s a matter of survival. This phrase has become something of a buzzword recently in business and tech circles, but what exactly does it involve? And why does it matter for your business? Writing at ZDNet about the “Next Wave of IT,” Simon Bisson describes digital transformation as shorthand for talking about the changes happening in today’s IT industry and where it’s going in the future. He believes this type of transformation will focus on technologies and processes including automation, personal and mobile computing, and cross-platform mobile development, among others—all tied together by the common thread of the cloud as infrastructure. IT as a critical component: Is your business taking advantage of digital technology, particularly cloud computing, across all areas of the organization? A focus on customer satisfaction: Are you using technology to understand customer behavior and enable customers to seamlessly interact with your business across digital channels? The end goal of digital maturity: How fully is your business embracing digital technologies, processes, and business models to optimize operations? Why is digital transformation important for businesses? As business becomes more and more tech-driven, whether or not companies are adapting and innovating to keep pace with changes will become an issue of survival: staying competitive, relevant, and able to effectively meet customer and employee needs. But aside from this basic reason, businesses that pursue transformation stand to reap a number of benefits. Digital analyst Brian Solis points out several in his “The 2016 State of Digital Transformation” research report. 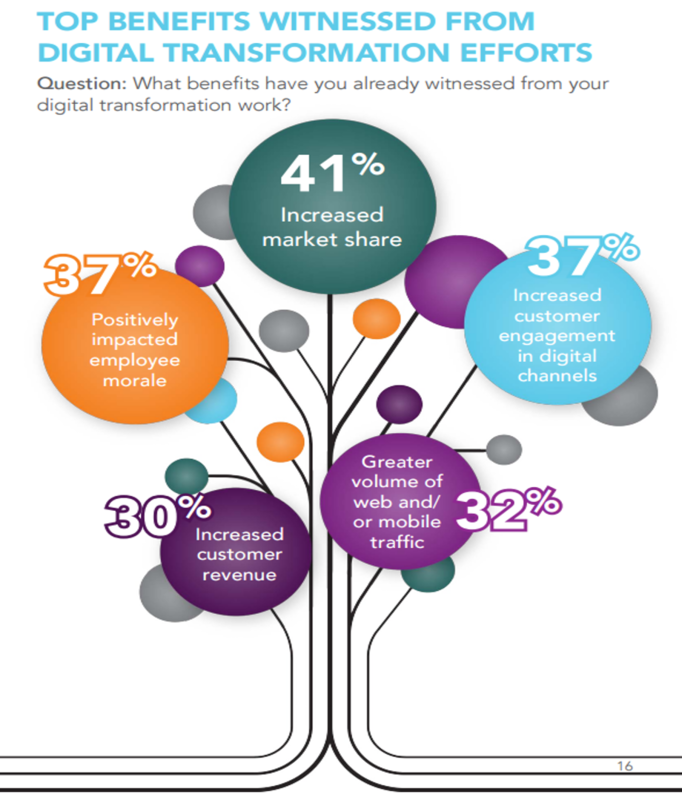 Organizations implement digital transformation initiatives for a number of reasons. Solis’ report identifies some of the top purposes as accelerating innovation; modernizing their IT infrastructure with increased agility, flexibility, management, and security; and improving operational agility to more rapidly adapt to change. But reaching these goals is no easy task and may not result in immediate rewards. It often demands flexibility, risk-taking, experimentation, and challenging the status quo. It also requires long-term investment of time and resources for companies to evolve into digital maturity, the state where they’re taking full advantage of digital technology to operate at maximum efficiency and quickly adapt to changing environments. The most successful transformation initiatives are holistic, implementing changes in technology (including social, mobile, analytics, and cloud), management, and skills/staffing to optimize operations for the digital economy. The problem is, many businesses are still optimized for the 20th century, taking an analog approach to operations in an increasingly digital world—this is a recipe for failure, but one that can be remedied by taking action to accelerate digital maturity. All organizations will fall somewhere on a spectrum of digital maturity and can plan improvements based on where they are. The ultimate goal of transformation is full digital maturity, a status that many industry-leading businesses have in common. Digital transformation isn’t some kind of universal checklist—rather, initiatives must be customized according to each organization’s situation and goals. Neither is it a one-time effort: companies that are using technology in transformative ways are always re-evaluating how they can take it even further to boost efficiency and outperform their competition. Businesses at this stage lack even the most basic digital resources to help make the company relevant to consumers, such as a mobile-friendly website or a social media presence. Reactive companies are doing the bare minimum to integrate digital technology into their operations. Existing efforts may not be very usable or fail to meet customer expectations. Businesses at the progressive stage are seeking to improve their digital capabilities. For example, they may recognize the need for a mobile-first approach or be using cloud-based technologies, but are still lagging behind industry leaders. Organizations already immersed in the transformation process are keeping pace with the current digital landscape to a greater extent than most of their competitors. Transformative companies have achieved seamless integration of digital technology in all areas of their business operations, embracing automation and blurring the lines between human- and tech-enabled functions. They are considered industry leaders and innovators when it comes to technology usage.